With its wild landscapes, pristine lakes, and rocky mountains, Maine is one of those places that inspires you to just hop in the car and set out on an adventure. When fall arrives, forests of orange, gold, and red surround the state’s highways and byways, creating a brilliant backdrop to your drives. Home of one of the oldest scenic byway programs in America, Maine offers many attractive drives that not only showcase the state’s impressive scenery but also take travelers through charming small towns and reveal some of the state’s interesting history. While traveling many of these roadways there are opportunities to get closer to nature by camping, hiking, or enjoying a picnic. If you’re itching for a road trip, don’t miss these four scenic drives in western Maine. Featuring historic towns, rushing rivers, and high mountain peaks, this scenic byway is most popular in winter, but spectacular to drive year-round. Route 27 begins in the 19th-century mill town of Kingfield and runs adjacent to the Carrabassett River before connecting to the towns of Eustis, Stratton, and Sugarloaf Mountain Resort—Maine’s largest ski mountain. From here, continue winding up Route 27 for views of Mount Abraham, the Bigelow Range, and manmade Flagstaff Lake as the landscape grows wilder and more remote. Stop at Cathedral Pines, the state’s largest stand of old-growth red pines, and a series of interconnected ponds called the Chain of Ponds. End in the tiny township of Coburn Gore, Maine, on the international border, or continue into Canada for some poutine. Stop to kayak or fish at this set of five linked ponds located right on Route 27. Make it an overnight trip with a stay at the area’s private campground. Sarampus Falls rest stop is also a great place to stop for a picnic or quick hike. See the 54-foot waterfall at the Smalls Falls rest area on Route 4. On this 52-mile journey along Route 4 and Route 17, you’ll encounter high mountain lookouts, sparkling blue lakes, and dense forests. When you’re traveling the National Scenic Byway, take time to pull off at the road’s apex, Height of Land on Route 17, to see a wilderness overlook lauded as one of New England’s best. One of Maine’s 10 largest lakes, Mooselookmeguntic Lake—and its Toothaker Island—are set front and center with the White Mountains creating a spectacular backdrop in any season, but especially when fall leaves peak. Make your next stop in the tiny town of Oquossoc at the junction of Route 17 and Route 4 to explore the historic Oquossoc Log Church, which was built out of spruce logs in 1916. Then, cruise to the route’s namesake resort town for year-round recreation amidst mountain and lake vistas. If you’re up for an indoor adventure, visit the quirky Wilhelm Reich Home and Museum, which celebrates the life of the noted psychiatrist, psychoanalyst, and scientist. The museum’s oddities include Reich’s cloudbuster machine, which he invented to change weather patterns by altering levels of orgone energy in the atmosphere. As a reward for reaching the route’s end, stop at Smalls Falls rest area along Route 4. The 54-foot waterfall flows into a large pool surrounded by colorful cliffs. 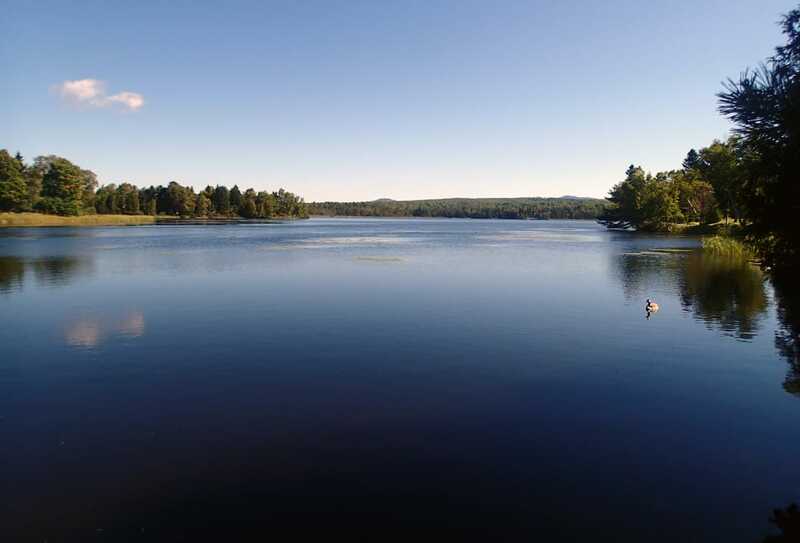 Take a break from the road to picnic, hike, or camp at Rangeley Lake. Take a break from the drive at the Coos Canyon rest area where walking paths, swimming holes, and waterfalls offer a welcome respite from the road. The byway also crosses the Appalachian Trail twice and passes the recreation areas of Rangeley Lake State Park and Rangeley Lake Heritage Trust, if you need more trails to stretch your legs. Find top-notch leaf peeping on this state scenic byway beginning in the town of Newry near Sunday River Ski Area. The colorful scenery continues as you follow the Bear River for most of its 21-mile journey. The route wows with views of waterfalls, the Mahoosuc Mountain Range, Grafton Notch State Park, and Lake Umbagog. Make your first stop just south of Newry at one of Maine’s most photographed covered bridges, Sunday River Bridge, a historic structure dating to 1872. Continue along to a 1,000-foot gorge where the Bear River cascades down 100 feet to form Mother Walker Falls. Drive north to see Appalachian Trail hikers’ favorite view, Grafton Notch. A glacier cut this mountain pass nearly 12,000 years ago, and the section is said to be the most challenging of the 2,200-mile Appalachian Trail. 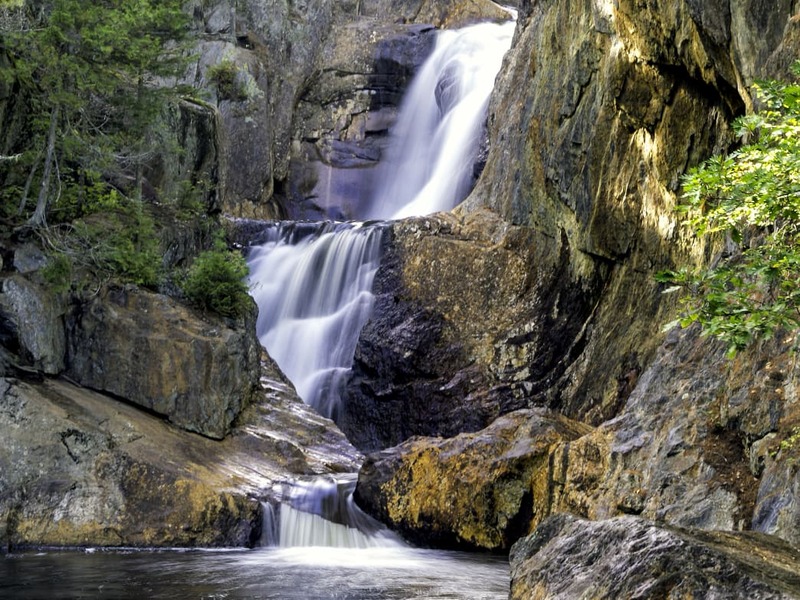 Screw Augers Falls is easily accessible from the Grafton Notch Scenic Byway. A short walk from the highway you’ll find Screw Auger Falls, where the water twists as it drops 23 feet through a chute. The slippery setting can be dangerous for kids, so don’t leave them unattended. Named for the Sokokis Indian tribe that lived in this river valley, the Pequawket Trail Scenic Byway on Route 113 snakes along the Saco River in the shadow of the White Mountains and connects the towns of Standish, Fryeburg, and Evans Notch as it weaves in and out of New Hampshire. Take a driving break between Standish and Fryeburg at Hiram Falls, a roadside stop with a sandy beach at the foot of a hydroelectric dam. Swimming, fishing, and kayaking are popular pursuits on the Saco River, which runs right along the byway. Flaming fall leaves paired with White Mountain panoramas make this State Scenic Byway most stunning in September and October. Due to snow, the White Mountain National Forest section between North Chatham and Gilead closes during winter. 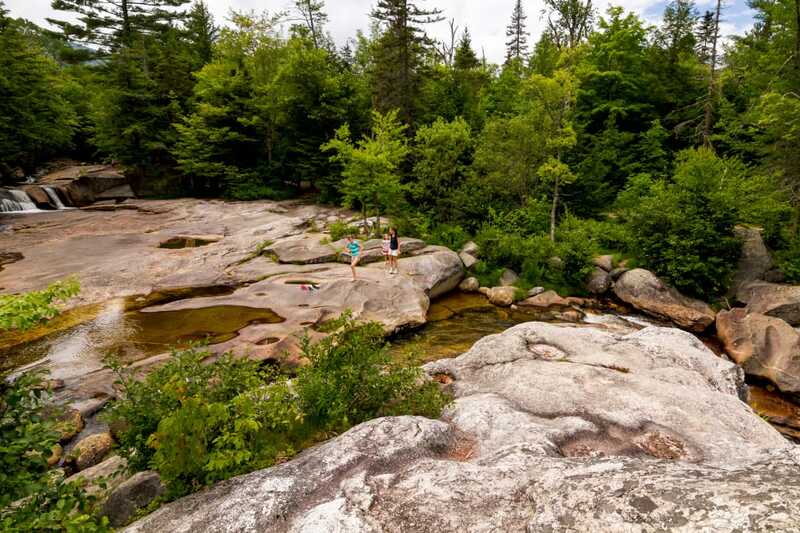 For epic vistas of New Hampshire’s White Mountains beyond the byway, stop in Brownfield to summit Burnt Meadow Mountain on a 2.4-mile trail by the same name. For a shorter amble, climb the Jockey Cap on a 0.4-mile (one way) trail that rises 200 feet. You’ll find the trail off U.S. Hwy. 302, just a mile from Route 113.